As founder of the Brave Foundation, Dane Braden travels from port to port, educating and advocating on behalf of the mammals he adores - and spends his nights finding solace in the arms of strangers. The last thing Dane was looking for when he met Lacy Snow was a relationship, and the last thing he expected was to fall in love. Fifteen months - and hundreds of flirty emails, steamy phone calls, and sensual video chats - later, they reunite and take passion to a whole new level. 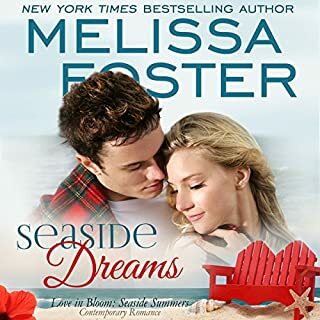 But as Lacy's phobia meets Dane's past love life, their steamy romance is upended, and when tragedy strikes, Dane and Lacy are forced to face their deepest fears head-on as they try to navigate their own sea of love. Sea of Love brings us the love story of shark researcher and founder of the Brave Foundation, Dane Braden and Lacy Snow, Danica and Kaylie’s younger half-sister. Dane travels all over the world educating and protecting sharks. Happy in his life and not looking for a relationship or love, he meets and is immediately smitten with Lacy Snow when they meet at Danica’s and Kaylie;s destination wedding. Lacy too feels the pull of attraction and heat between them and so begins a fifteen month “relationship” of sort. Dane and Lacy learn about each other through texts, emails, FaceTime and phone calls. Playful, often naughty, flirty and sensual, but never syncing their schedules to meet again until they both attend Max and Treat’s wedding. Both wondering why they didn’t make the time before now, they embark on a passionate journey all their own, until the past and Lacy’s real fear of sharks and what caused it threaten their new found romance. The ups and downs forces them to face their differences, their pasts and whether or not they can have a real future together as they navigate their own sea of love. BJ Harrison has become a favorite narrator for me. His voice is hypnotic and brings life to Melissa’s characters, differentiating between them seamlessly. I am ready to set sail! 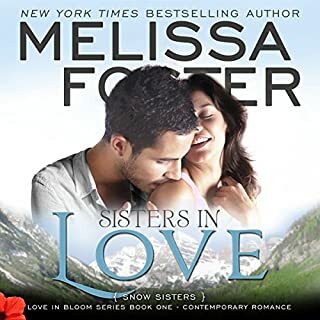 Another amazing book by Melissa Foster. This is the story of Dane Braden, founder of the Brave Foundation, a shark Conservatory, and Lacey Snow, one of the Snow Sisters from the original books that started the whole wonderful world of Love at Bloom. Dane and Lacey have spent the last 15 months and burning up the phone lines, Skype and email since Lacey's sisters double wedding. Another wedding had brought Dane and Lacey back together so they could start down their path to forever love. But the road to forever love is never smooth, and they must face their own trials and tribulations along the way. This book is a prime example of how Melissa Foster's mind has a phenomenal way of weaving together a world that is so lifelike and real that you feel like you could meet these people on the street. Listening to Melissa's words brings a different and exciting feel to the story. My only suggestion is to be careful where you read "listen" because some of the scenes are a little steamy. Enjoy. 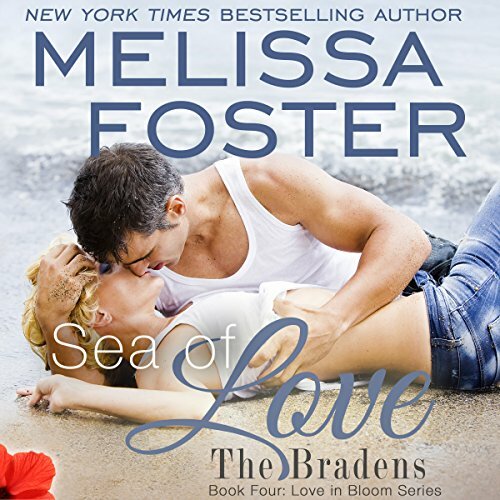 Melissa will make all of the Braden's special to you, as they are to me. B. J. Harrison's narration is nothing short of marvelous! Lacy Snow met Dane Braden at her self-sisters wedding in Nassau some fifteen months ago. Dane was traveling the world over in and out of the water trying to save sharks. There had been an attraction between them and they had been in contact with each other ever since. When Dane's brother Treat and Max got married, they met again. Lacy was an account executive for World Geographic and she worked long hours. Lacy was afraid of sharks because she had been traumatized by on when she was young. She had a scar on her leg to prove it. Can love overcome this fear? Exciting story! Dane Braden has a love of sharks, and has a need to show how much we have to learn about them. Lacy Snow has a fear of sharks due to past experience but Dane and Lacy have a romantic friendship and 15 months of flirting and passion sitting right under the surface, ready to boil over. I love this story and the back and forth about fear, from both sides, because it is not just her fear that holds them back. Really recommend this to everyone who likes some good romance! This series just gets better and better! Sea of Love is the story of Dane Braden and Lacy Snow who met at a wedding. They have not seen each other for 15 months but over time have developed a phone, text, and Skype relationship. When they finally see each other they become intimately involved. But Lacy has a secret that will challenge their relationship and their future. BJ Harrison’s voice is melodious and riveting. I love how he reads patriarch Hal Braden. He also read with emotion that touched me during scenes regarding Dane’s friendship with coworker Rob. This was an excellent audiobook. Sharks or love--which one to be more afraid of? I loved coming back to this book a couple years after initially reading it and listening to the audiobook version. Lacy and Dane, who were introduced during of Melissa's &quot;Snow Sisters&quot; series, come back together after months of keeping in touch and steamy conversations. This book was great to experience as an audiobook because you could really feel the emotion conveyed between the characters.Between the physical distance that has separated them and the two separate &quot;worlds&quot; they come from, as a reader you really aren't sure if these two are going to overcome fears and reservations to come together. They really do have to build on everything they built in their long distance relationship and explore their fears. If you could sum up Sea of Love in three words, what would they be? This book just jumps right into the chemistry of Dane and Lacy. They have a history for Danica and Kaylie's wedding. They are so steamy you can feel it though the pages. Lacy has a huge fear to over come that the fear just happens to be Dane's whole life. I enjoyed reading this book a few years ago, but listening to it I've picked up on so much more detail. BJ does such a great job. 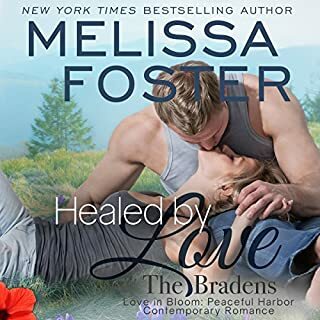 Yet another great story by Melissa Foster and of course a great tie in from the Sister books and Braden's. I highly recommend the whole series and as any of the others in their series this one is great. 15 months of flirting culminates when Lacy and Dane see each other for Lacy's other sisters wedding. Another hot and steamy Romance narrated by a fabulous narrator. Can't wait for the next one! The Braden saga continues with Dane Branden taking the plunge. Dane and Lacy have only actually seen each other once in the past 15 months. Their attraction was immediate and strong but their careers drove them in different directions and kept them apart, physically, for over a year. Theirs is a story of learning to overcome fears. They’re both young and idealistic, determined to follow the path they have set for their lives. They’d met at Lacy’s sister’s wedding 15 months earlier and were wildly attracted to each other but did not have the time or opportunity to explore their feelings. They have been communicating with SKYPE and phone calls all this time and now Dane’s brother, Treat, is getting married and they have both arranged to take the time to get to know each other and see where it all goes. Dane’s love of the ocean, and sharks, is his life and his livelihood. He has always used this as an excuse to never commit to anyone. He spends 98% of his life on the water, even living on his boat. No ties. He has avoided commitment ever since the loss of his mother as a young boy. Watching the pain his father has endured every minute since his mother passed has made him think that loving someone that much is not for him. His career also poses a huge problem for Lacy, who was attacked by a shark at a young age and bears the scars, inside and out. She is afraid Dane will not want anything more to do with her if he finds out she is deathly afraid of sharks. Not to mention that she is just starting to make a name for herself in her chosen field of marketing and she doesn’t want to give up all the ground she has gained in the industry to travel the world’s oceans, even if it is with the sexiest man she has ever known. The journey these two must make to conquer their fears is the crux of this story and I found it very moving. It makes you stop and think about your own fears, what would you do to get over them, to move forward with your life, and to have the happiness that is right in front of you, but just out of reach? Not all sharks are bad. What did you like most about Sea of Love? This was a coming of the Snow sisters with the Braden Family. It was good to catch up with Danica and Kaylie. So many to choose from, Dane because he loves his job and so wants to share that with Lacy. Kaylie for her sense of humour, Danica for her love of her sister and Lacy for overcoming her fears to be with Dane. He did a good job with all the characters. When he is in female mode you forget he is male. I have re read the book and have just finished listening to it again, still as good a the first time. When Lacy has her light bulb moment that accidents can happen everyday.